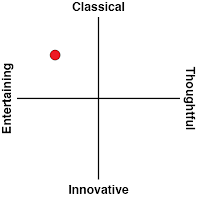 I like to think that I’m pretty good at finding the positive qualities of games, even ones that are “bad”. There are lots of widely-panned games that I rather like, and even in games I don’t enjoy, I can usually see at least see the potential. It’s not often that I have nothing good to say, which puts Space Overlords in a unique position: this is, without a doubt, one of the worst games I’ve ever played in my my life. 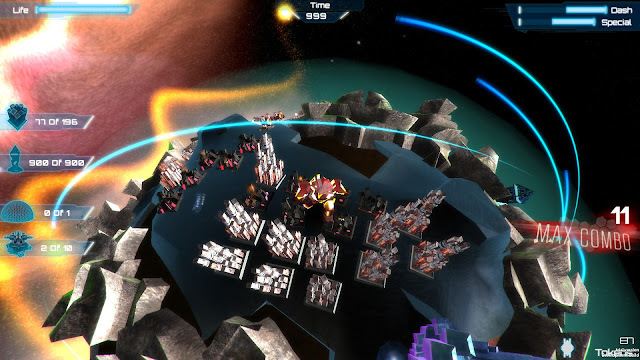 In Space Overlords, you play as one of four space overlords (geddit?) who is at war with their evil sister, for some reason or another. 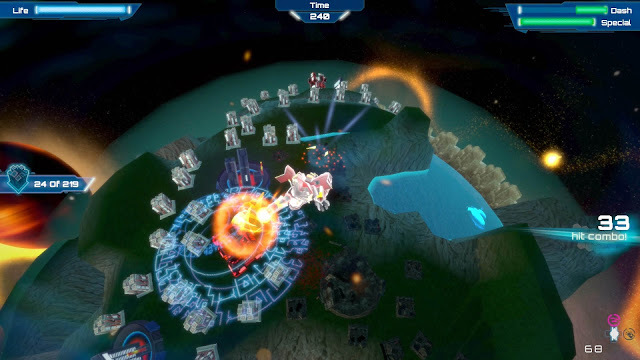 Fighting this war involves going from planet to planet, destroying everything in your path. That is more or less the extent of Space Overlords – it’s a simple action game about trampling buildings on tiny planets. That would fine, that could even be fun, except that this game is nigh unplayable. Hit detection is an utter disaster, making the simple act of trampling buildings frustrating and tedious. Enemies come in hordes and spray you with bullets, but limited mobility means that avoiding the gunfire is more or less impossible – all you can do is weather the storm and hope you hold out long enough to destroy the required number of buildings. That’s made even worse by how susceptible these all-powerful overlords are to getting stuck on geometry, despite the very simple level design. Your options for fighting back include high and low attacks, which, as far as I can tell, are functionally identical. I never encountered any enemy that’s more susceptible to one attack or the other. It's almost as though the two different attacks were implemented purely as a means of working another button into the control scheme, not because it actually adds anything to the game. You also have a special attack, which needs to be charged up (by killing things, I think – the mechanics of this are never really explained). It’s a powerful attack, so it makes sense to limit its use somehow, but it’s also the only attack that seems to have any degree of usefulness. Finally, you have a sprint button, which is useful for moving around, but is gated by a gauge that drains surprisingly quickly and takes forever to refill again. This is a minor annoyance most of the time, but there are enemies that can only be killed by dashing through them, which turns that recharge time into a disaster. Finally, you’ve got power ups. 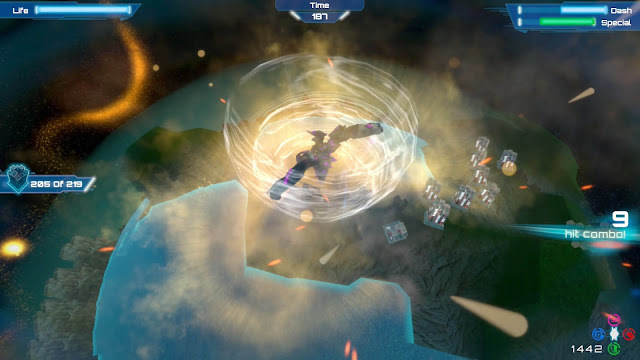 As your overlord tramples buildings and kill enemies, it acquires points that can be spent to temporarily increase its defence, attack, or speed. The differences are barely noticeable, though, and they don’t do anything to address the core problems with the game. This is all wrapped up in a story that’s incredibly simple (stop the bad guys! ), yet still somehow manages to become convoluted and confusing in its telling. There’s a visual novel-style cutscene before each level, but they seem completely disjointed from what’s actually happening when you’re playing. Poor writing and and font that’s a nightmare to read make it even more difficult to follow. There’s a multiplayer mode for those who want to share the misery, but I haven’t been able to test it out. It seems like everyone else has the good sense to not be playing this game, so I’ve been unable to get into a single multiplayer game. This game’s failings are at such a fundamental level, though, that I can’t see the addition of some friends helping matters at all. You can also create and share maps online, but the map editor is incredibly limited. You can’t modify the geometry of the planet in anyway; instead, you have a handful of presets to select from. What you do have control over is what buildings you place and where, but that’s far from enough to create compelling levels. Furthermore, there are no checks and balances in place, so it’s very easy to create and share levels that are functionally impossible. The most disappointing thing for me, though, is what’s probably the least of Space Overlords' worries: it just doesn't feel right, on that primal level that action games generally tap into. Despite the title, playing the game made me feel small and weak – not just because of the mechanical hindrances, but because of the lack of any sort of feedback. Even a poorly-made hack and slash game can be fun in short bursts when your attacks feel forceful. A little bit of screen shake and the right sound and visual effects can work wonders for making the player feel powerful, and that can make the game exciting. 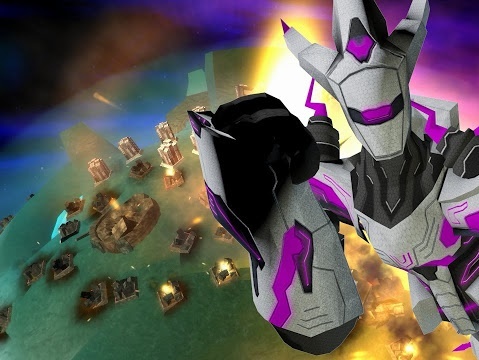 It’s something that games have been doing for decades, but I’ve never felt weaker than in a game that literally casts you as an alien overlord.